Garage lighting is critical to any well-utilized garage. Having adequate lighting in your garage is absolutely essential. In addition to convenience and safety, good lighting will also allow you to complete your projects easier and with better precision. You simply have a much greater chance to be successful when youre able to clearly see the project youre working on from all angles. By having sufficient garage light, youll be able to avoid plenty of frustration caused by poor lighting conditions while working on small objects, or when your view of the work is obstructed or hidden. One way of providing a ton of daytime light is by adding a couple of skylights to your garage. Although it can be a little pricey, it's definitely something to consider, especially if you use your garage as a daytime shop or a living space/apartment. 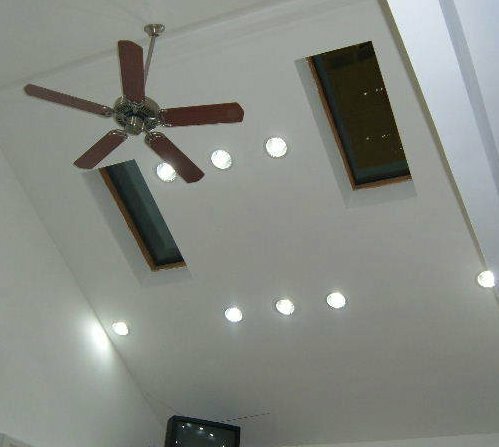 Combining recessed lighting with skylights as shown gives you enough light for pretty much any daytime garage occasion. Your garage should already have at least one overhead or stud-mounted light socket. This is usually turned on and off by the switch closest to the door that leads to your house. If you have a garage door opener, then it will usually have at least two sockets for light bulbs. In addition to those lights, you should install at least two fluorescent light fixtures that hang from your garage ceiling. These fixtures have two bulbs and a pull string. They plug in directly to one of your garage outlets so you dont have to worry about hard wiring or installing a new circuit with a higher voltage. So, your pre-existing lights in combination with the fluorescent fixtures gives you a pretty good lighting base to work with. However, there will be times when your shadow blocks light from your project. Because of this, you should also install at least one drop light, and keep a clip-on light handy as well. Like the fluorescent fixtures, the drop light plugs directly into one of your garage outlets. The drop light cable will usually extend about 20 feet or so when its fully unreeled. Another advantage to having a drop light is that they often have outlets built into the bulb housing that you can use for things like drills and saws. Drop lights are available in both incandescent and fluorescent models. Your best bet is to install one of each. Do yourself a favor and add more light in your garage... you won't regret it.